I love the rustic charm of decorating with wood lanterns, and you know what they say ‘Go big or go home!’ Doesn’t everyone need a giant wood lantern for their front porch, wedding or party decorations??? I think so! 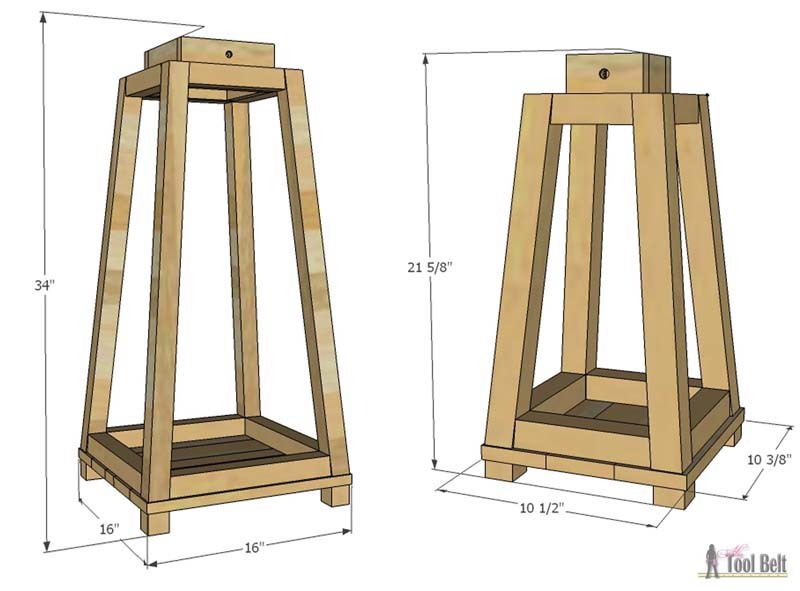 The large lantern is about 34″ tall and the shorter one is about 21″ tall. You can easily change out the decorations for each holiday. I like the candle lit glow in the evening! 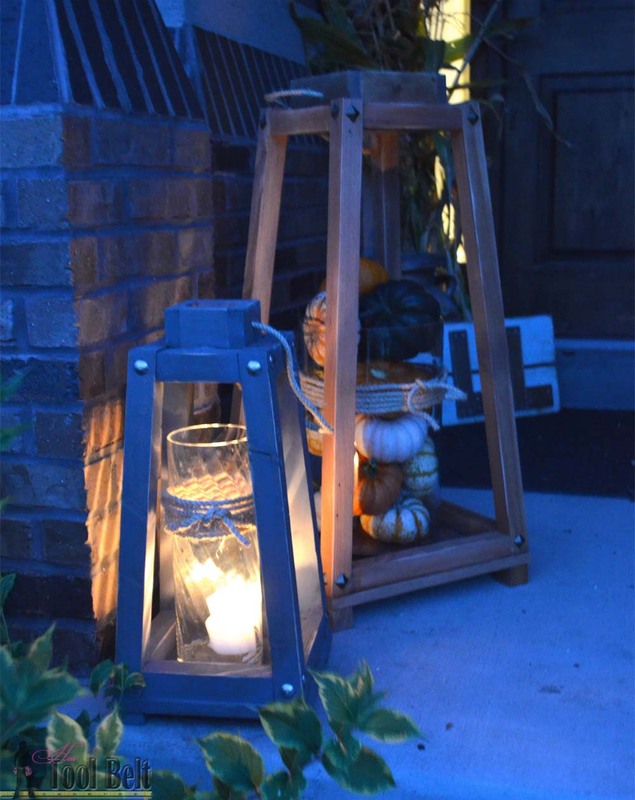 Wouldn’t a hanging mason jar cluster be fun in the large lantern? 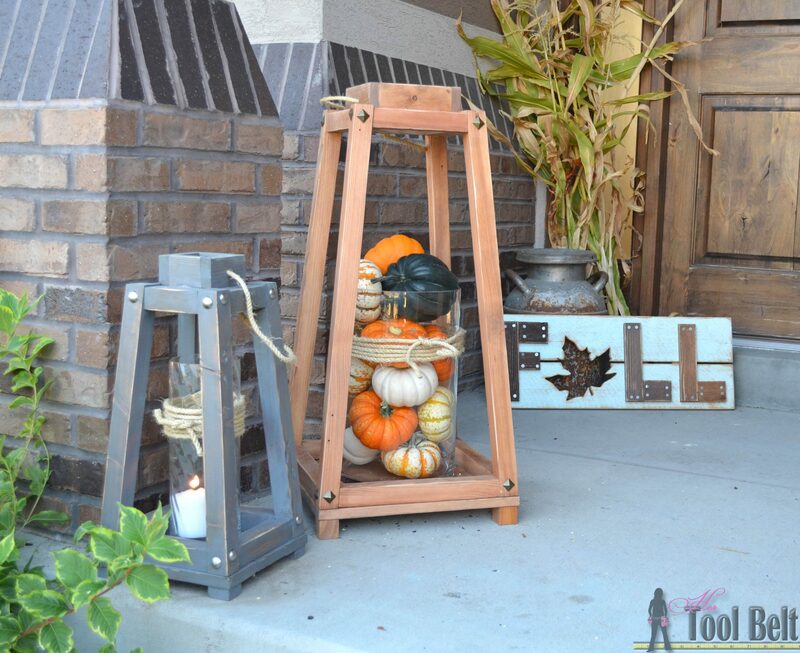 The large lantern will cost you about $15 to make if you add the decorative nails. 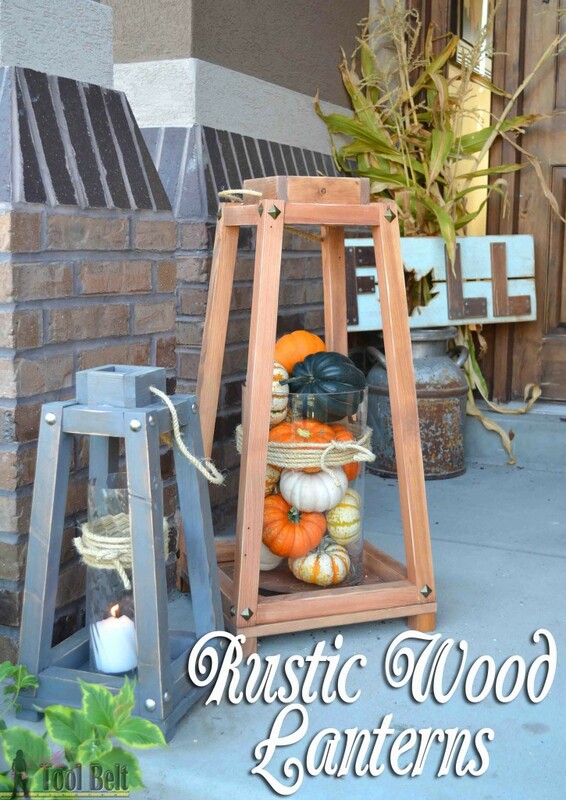 I’m teaming up with Ryobi Nation this month to share the plans for these rustic wood lanterns. 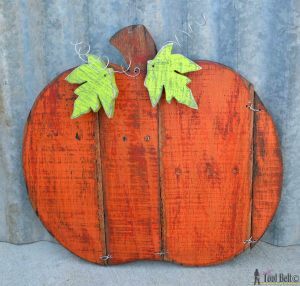 You can get the full tutorial and plans at Ryobi Nation. Thanks for visiting and happy building! I want these!!! They are adorable!!! Dang Amy you are on a roll, these are seriously adorable! Amy, I LOVE all of your great projects! I really love these lanterns. You are amazing! I would like to make one, but I do not understand the first step…I know right, does not bode well for me! what do you need by:”with a 5 deg miter angle and 5 deg bevel angle (head tilt) on both ends of the legs.”? Do you have a compound miter saw? I added a picture to the bottom of the post that hopefully helps. 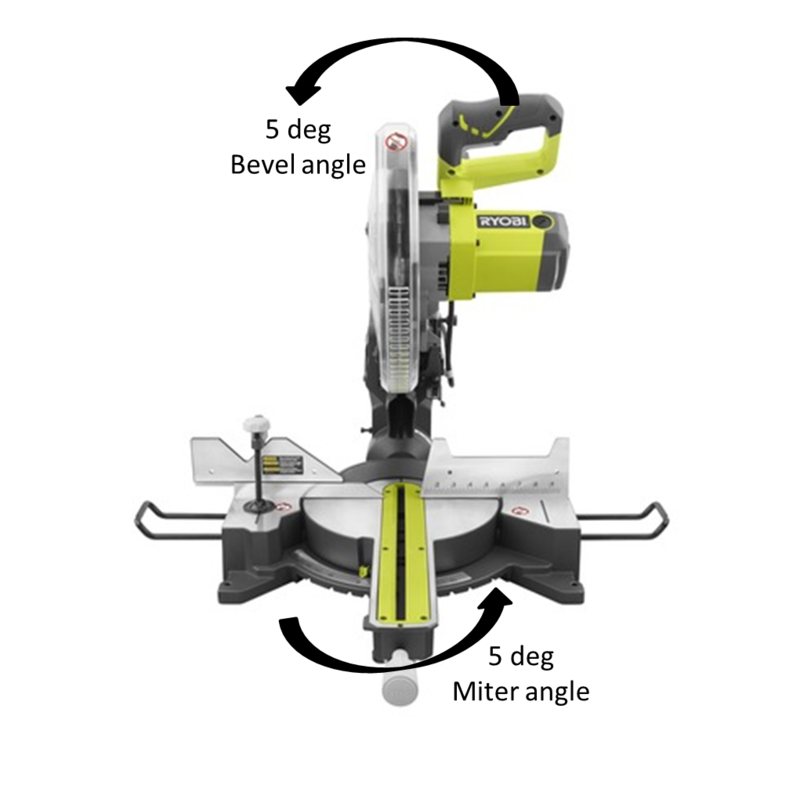 thanks for the picture, totally makes sense now, I just never moved my miter saw from the vertical, never had the need for a bevel angle, this is opening some new opportunities! I was going to go for the square look, but I like yours some much more. These are super cute! I think I’ll make some for my MIL”s birthday this month. And maybe some for our school auction. I love your idea for hanging mason jars, what about some giant size (gallon) mason jars on the bottom?! Love them! They look so much better than store bought!